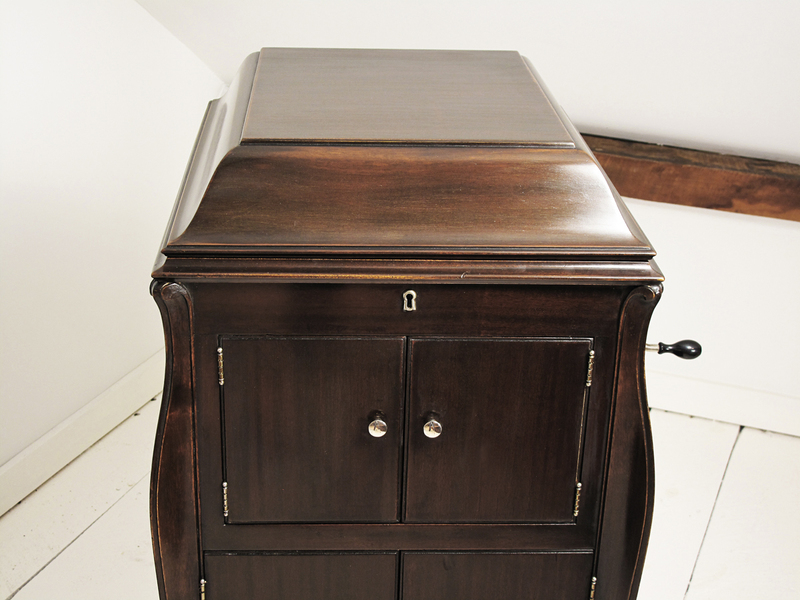 A 1920’s full size Mahogany Victrola VV-XIa. It’s complete with the motor working well. The motor had been taken out and cleaned, including the motor springs. It plays very well. The motor governor has a missing counter weight, which means after winding it up, the turntable just needs a light push to get it going. 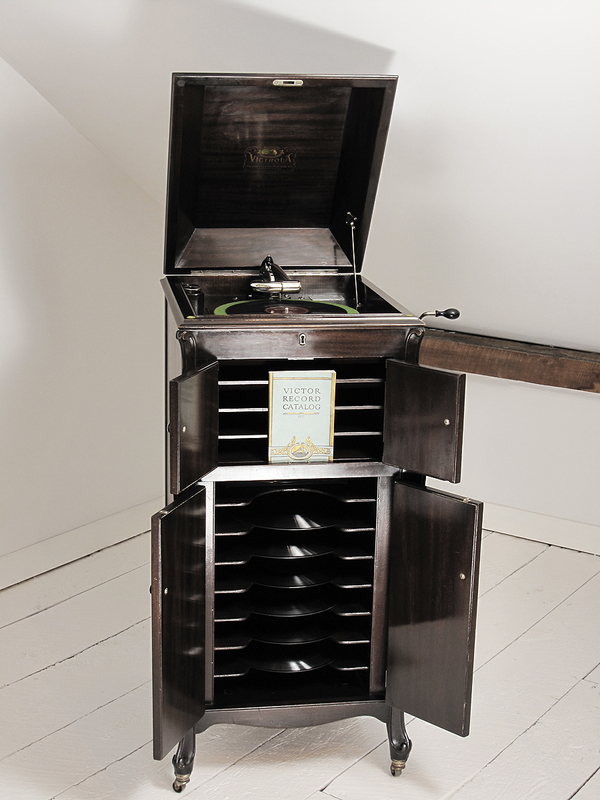 The springs hold a fantastic amount of energy, giving this Victrola an excellent amount of playing time. Mechanically it will play records for a very longtime to come. 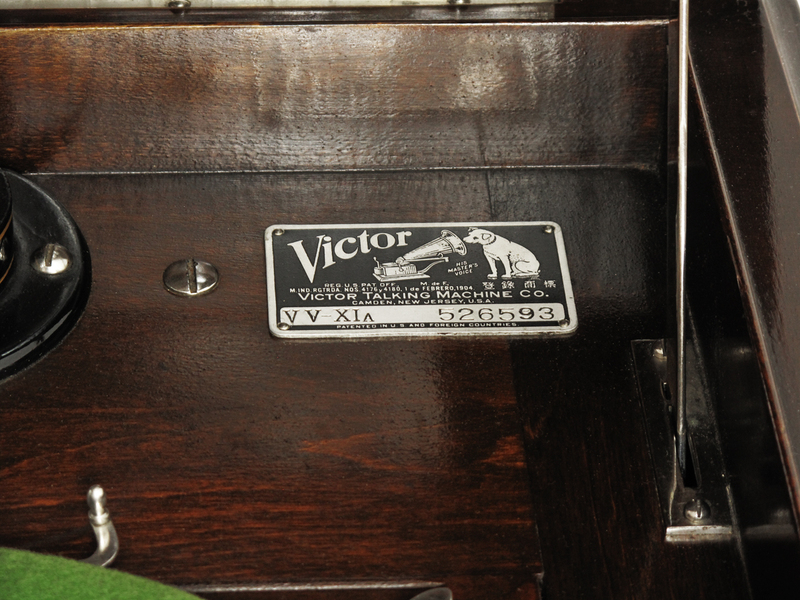 The mahogany case to this Victrola has an original finish, which shines nicely. It has normal wear, dings and scratches to the finish. The original lacquer fiinsh has some cracked areas, but this is to be expected of an old finish. It shows very nicely. 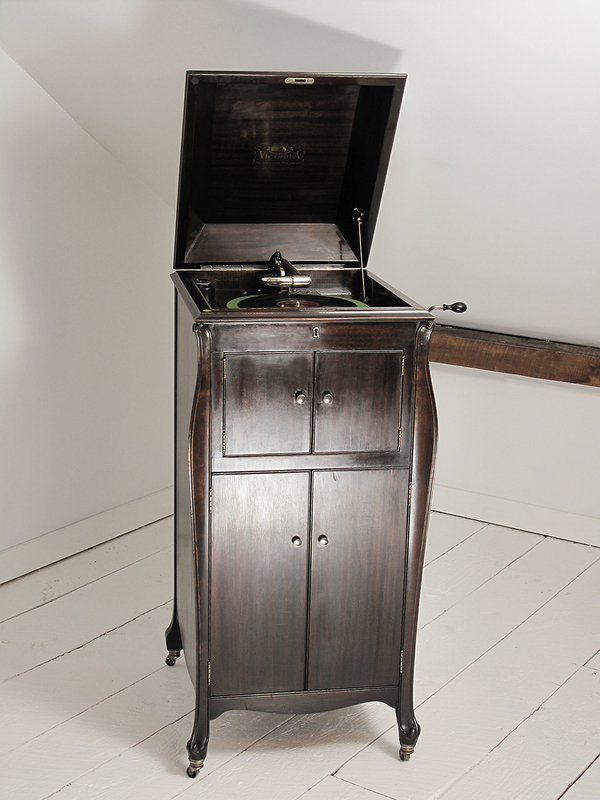 The Victrola has been cleaned and waxed with a fine museum wax, giving it a fantastic shine! Definitely a very solid fully functional Victrola. The bright work is excellent and the nickel plating is exceptionally well preserved. 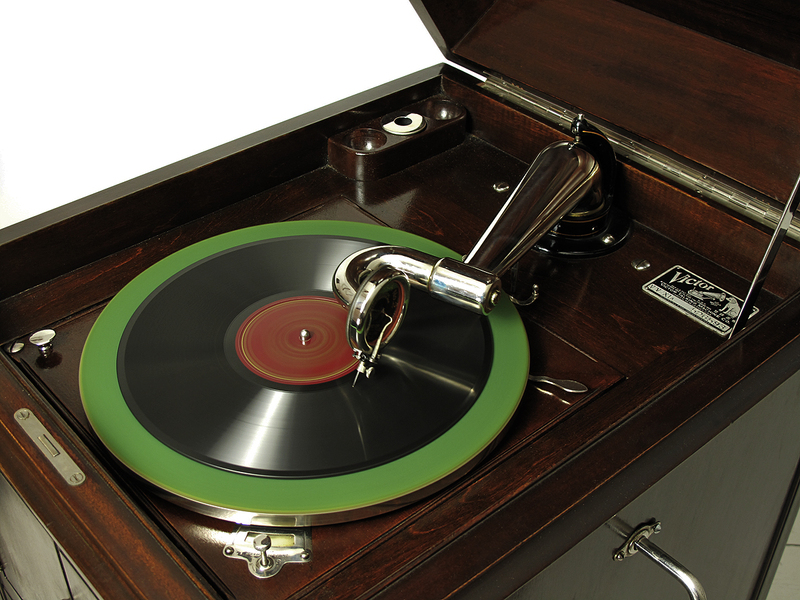 The Victrola comes with a 1927 music catalog, some needles and a few records. A very enjoyable piece! 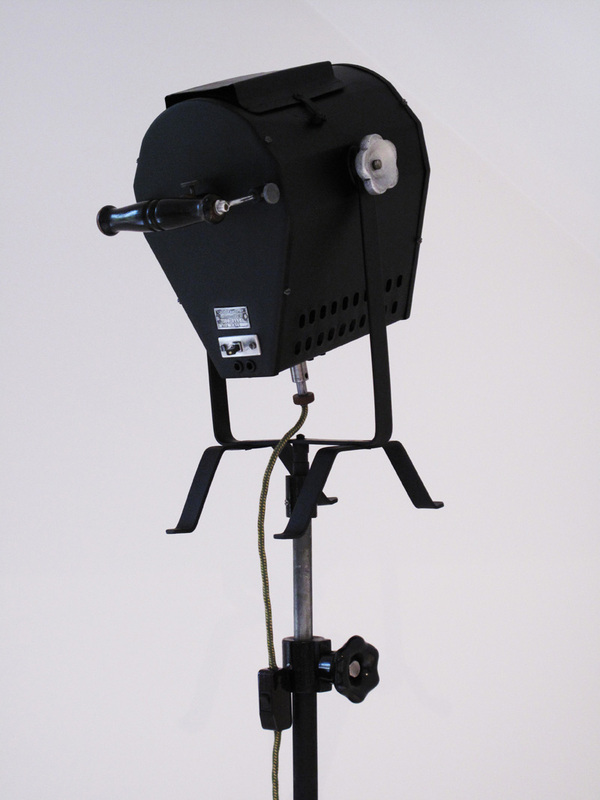 A very rare early German cinema/stage light, which has been rewired with a period fabric cord. Would be a very stylish decorative living room piece. The wiring can handle up to 500 watts, but for domestic use, such as using it next to a sofa, 40-100 watts would be sufficient. It currently has a 40 watt bulb fitted, which I find ideal to read under. 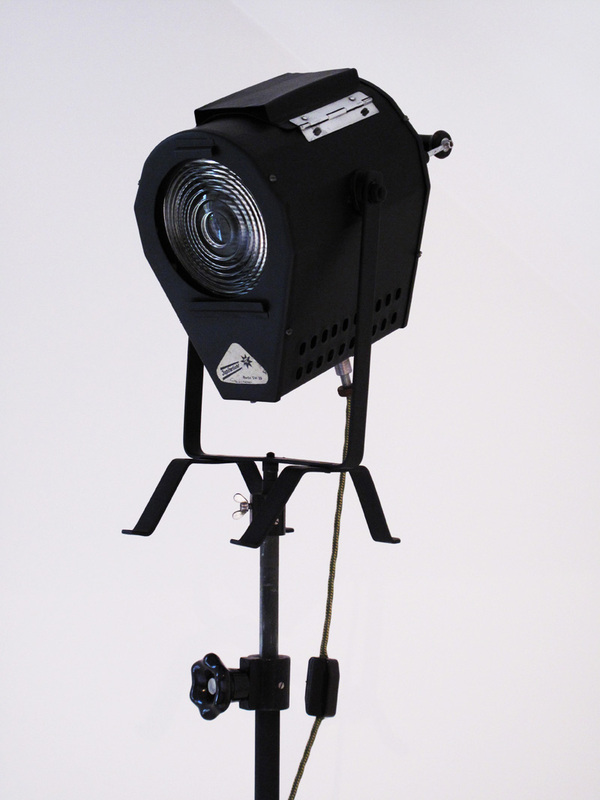 The construction is very solid, with many pieces made of a light alloy and a cast iron base. 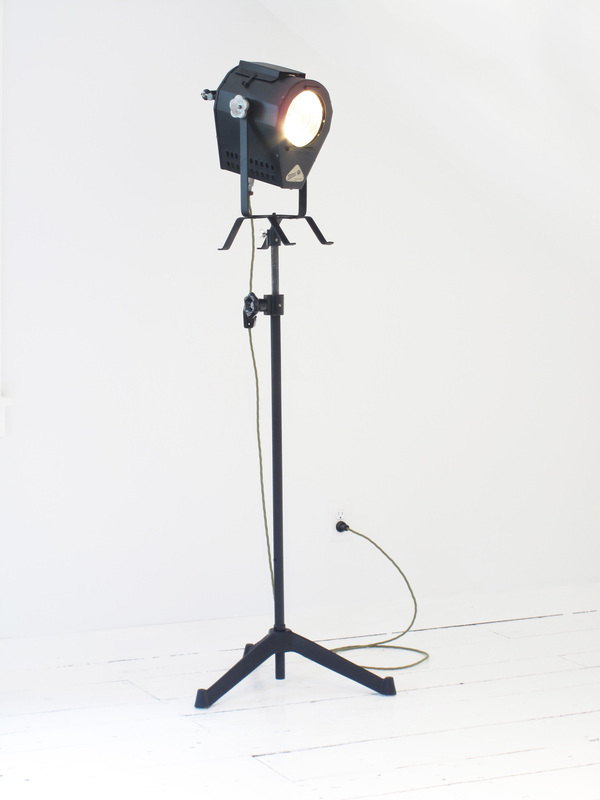 The height adjustable handle is made of ebonized bakelite. 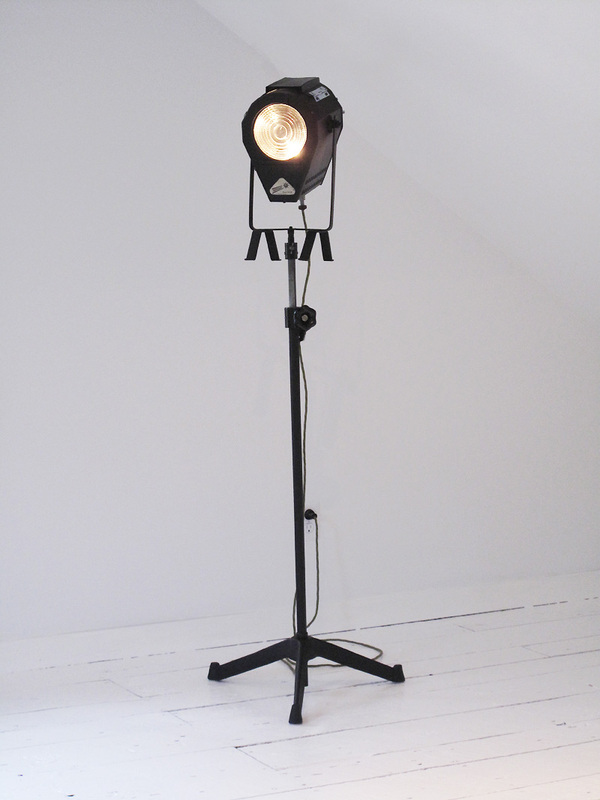 The original glass and internal reflector are in exceptional condition. The wiring had been redone for domestic use, with an on/off switch attached to the cord and a new period style plug. The fixture and base have been repainted. At a point in it’s life, someone hand-painted the light housing, so it had to be sanded, in order to achieve a smooth finish. 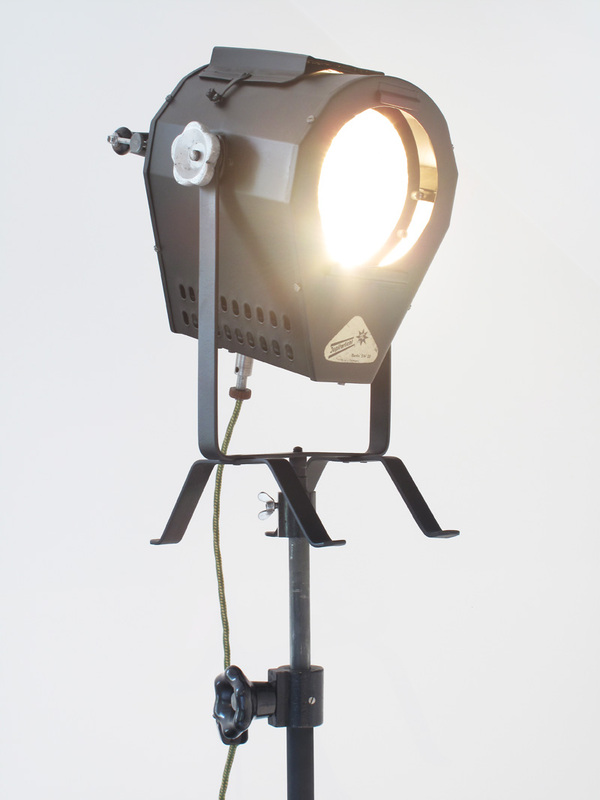 The light has some dings, as expected of a period item, which evidently got lots of use. During the 1920s, Berlin was one of the worlds premier film, cabaret and arts centres. The classic movie, Metropolis was filmed during this period. 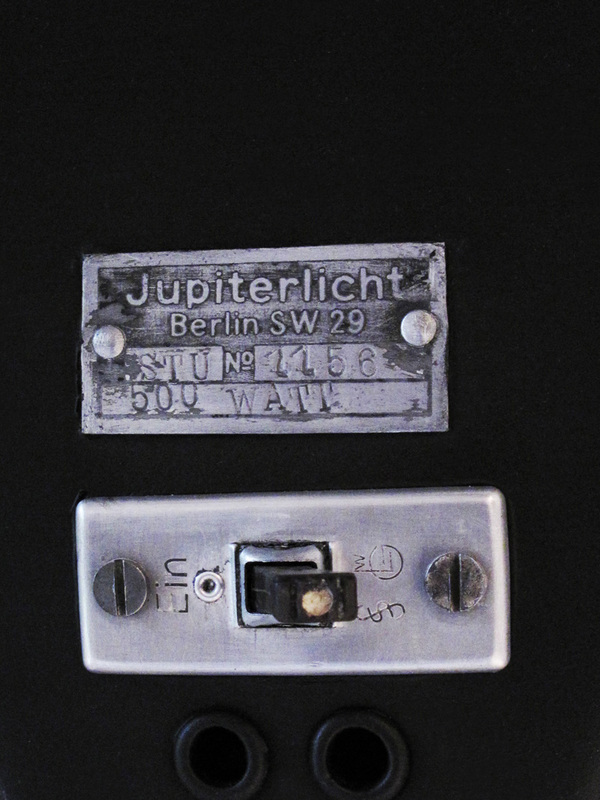 Jupiterlicht must have been the most advanced and desired lighting during the era. 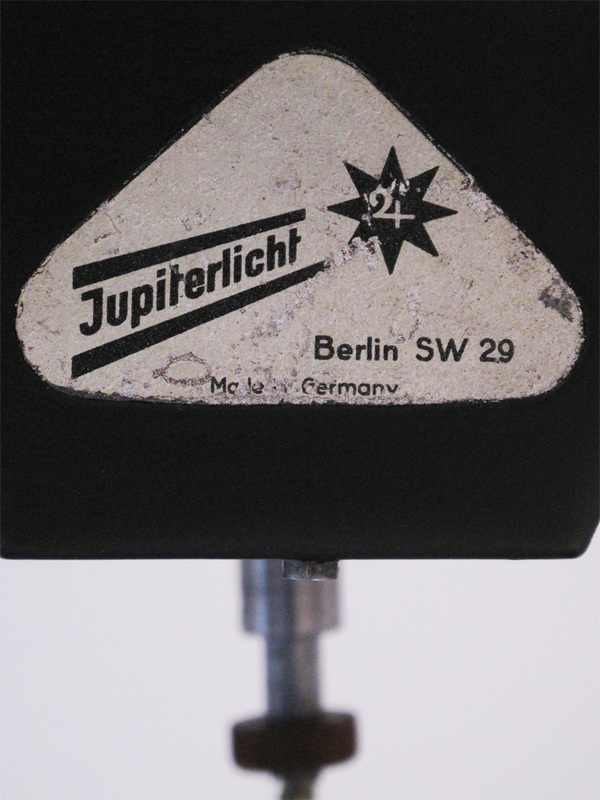 There are very few surviving Jupiterlicht lights from this period, none of which seem to be for sale. It’s also highly unusual to see one, which had been made for the North American market. Truly a rare piece! The item will ship in two boxes by UPS. It must be insured for the full sale amount. Please be in contact for shipping and handling charges. International shipping offered. Delivery is available throughout New England and the boroughs of New York City. 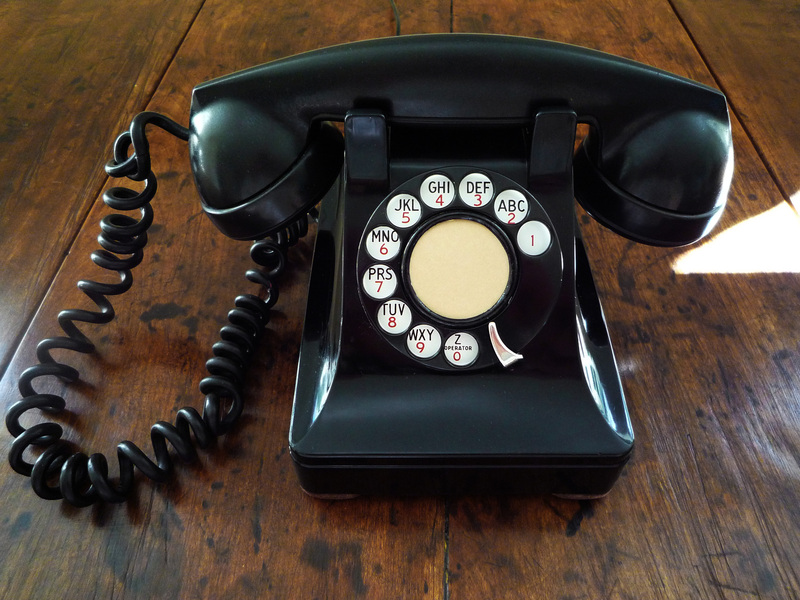 Offering an original 1940’s Western Electric Telephone. It’s in very fine condition, with very few scratches to the handle or bakelite telephone base. The 1950’s cord going to the receiver has a few cracks in the wire covering. This does not affect the interior cord and the receiver works perfectly. Both the speaker and microphone are crisp and clear. The rotary dial is smooth and made of metal. The ringer is fantastic and reminds me of so many brilliant 1940’s movies. I’m personally amazed at how nice the shine is and how little wear is present. The original four-prong plug is attached and can be plugged into the wall outlet with an $8.00 adapter from an electronics store. It could also be wired right into the wall outlet. I’ve personally tested the phone by attaching the wires in the plug, to a phone outlet. All the functions work perfectly. Early telephones were meant to last forever and almost never break. Please be in contact for shipping and handling charges. International shipping is available.